This article first appeared in The Edge Financial Daily, on May 8, 2017. KUALA LUMPUR: Foreign investors pulled back from the Malaysian stock market in April 2017, with total foreign purchases of Malaysian equities dropping 32.3% to RM10.9 billion from RM16.1 billion the previous month. 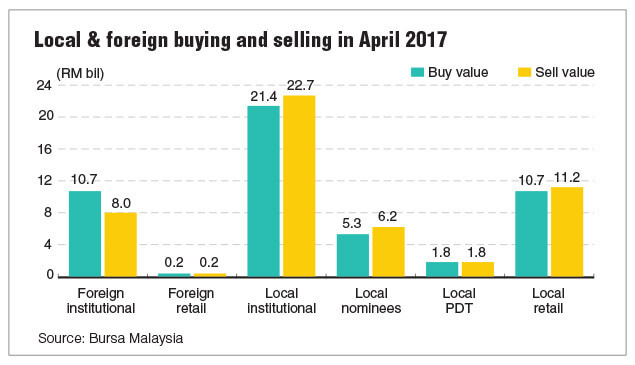 As a result, foreign institutional and retail investors’ exposure as a percentage to total value of Malaysian shares traded fell to 19% last month from 20.75% in March 2017. Data from Bursa Malaysia released last week showed that foreign trading volume also declined 25% to 3.9 billion shares last month from 5.2 billion shares in March 2017. Nevertheless, foreign purchases of Malaysian stocks were still above the levels recorded in January and February this year of RM9 billion and RM7.8 billion respectively. Foreign trading activity for Malaysian stocks has also been rising from three billion shares and 3.4 billion shares in January and February 2017 respectively. According to market analysts, foreign institutional and retail investors’ flow will continue to remain robust in the near term as Malaysian market performance still lags behind its regional peers. “Investors globally are on a ‘risk-on’ position where their risk appetite is relatively higher, with a focus on emerging underperformed markets like Malaysia which has lagged behind its peers in the past three years,” Areca Capital Sdn Bhd chief executive officer Danny Wong Teck Meng told The Edge Financial Daily. Year to date, the benchmark FBM KLCI has risen 7.8% to close at 1,762.74 points last Friday. This compares with Thailand SET Index’s gain of 0.35%, 7.7% increase by Jakarta Stock Exchange Composite Index, and 11.41% rise by Singapore’s Straits Times Index. Wong sees the Malaysian market playing “catch up in a bottom-up economy”, adding that a small stock market correction is likely this month. “It is too early to judge whether there is a ‘bubble’ in the making. I guess the bubble would have some more room to grow, just waiting for a potential small correction in May,” he said, referring to the local stock market’s strong run. Philip Capital Management Sdn Bhd chief investment officer Ang Kok Heng said he would not be surprised if a small market correction happens, noting the well-known trading adage “Sell in May and Go Away”. Nonetheless, Ang believes there’s still room for more foreign buying on Bursa. “Other regional markets have been seeing foreign inflows much earlier than Malaysia; we are just catching up. Yes, we expect there is some more room for more foreign buying of Malaysian equities. The entire mood has changed [for foreign investors] since the US dollar stopped strengthening against major currencies like last year,” he added. Inter-Pacific Research Sdn Bhd head of research Pong Teng Siew concurred, saying that the higher money supply and credit flow in Malaysia implied more business activities in the pipeline. According to Bank Negara Malaysia’s data, March broad money supply, M3, grew 4.5% to RM1.67 trillion, from RM1.60 trillion in the same month last year, while total loan in the banking system grew 5.96% to RM1.54 trillion, from RM1.45 trillion in March 2016. “There are reasons to be optimistic in Malaysia ... the money supply implies great deal of liquidity in the market. There is also better credit flowing, but it is also because foreign investment banks are positioning themselves for a piece of advisory business opportunity here,” Pong said. He noted that one of the notable corporate exercises that most investment bankers are eyeing is the proposed demerger of Sime Darby Bhd’s businesses. In February this year, the diversified group proposed to float its property and plantation divisions separately on Bursa through distribution of shares to its shareholders. With the completion of the exercise, there will be three separate and independent listed entities with distinct businesses, with Sime Darby Plantation and Sime Darby Property to undertake the current plantation and property businesses of Sime Darby. Sime Darby itself would remain listed with the trading business comprising motor and industrial, logistics business, and other businesses including healthcare, insurance, retail and investments.